Thank you all so much for your lovely comments on my pinafore skirt! I actually can’t quite believe I’m here 3 days later to post another finished sewing project. But friends, I did it. I finished a project for Debi’s Sew Grateful week! Keep reading and you’ll find out why these are for Sew Grateful, as there’s a whole slew of reasons and people to thank! An hour later I was washing 4 different fabrics and trying to decide on a pattern and a fabric combo. A few hours after that I was cutting fabric. Tuesday night before bed I was prancing around in these. 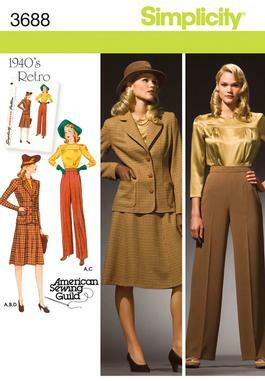 The pattern is Simplicity 3688, a reproduction pattern from 1941. If you read any sewing blogs, odds are you’ve seen at least someone make or talk about these trousers. Prevailing opinion is they’re easy to sew and they’re flattering. And my opinion on the prevailing opinion? AGREED. Because I intended to sew these faster than the speed of light I pretty much followed the pattern instructions to the letter. I think the only things I did different was to change the zipper application and to hand stitch the waistband shut on the inside instead of stitch in the ditch. I also sewed one size down from what I would have normally after measuring the pattern pieces and realizing they’d be gigantic! I love them. LOVE THEM. I’m totally making them again and again. I did a centered zipper instead of lapped as I thought the fabric might be too heavy for a lapped zipper to look nice, so I took a queue from the Wearing History Smooth Sailing pattern. I have no idea where the instructions came from because I wrote them out by hand in my sewing notebook when I made my Smooth Sailing trousers, but wherever I got them, the results are great. I love the vintage button that closes these. I have several more, so someday they’ll make it onto another project. Though I may need to add a hidden snap on the inside of this pair to keep the button from meandering over the edge of the waistband. I cut off about 3 1/4″ off the length of the pattern from the bottom, turned up 1/2″, then 2″ again for the hem, and blind stitched by hand. I may do a folded up cuff next time but it wasn’t in the cards with my tight deadline. Now, here’s the lengthy Sew Grateful elements! 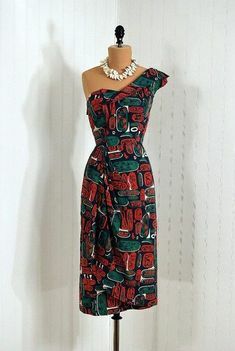 I think I first saw this pattern when Debi sewed them, but have also seen them on the likes of Jane (twice! ), Karen and Lauren over the last 2 years. I bought the pattern at some point after reading about them so many times, but hadn’t sewn them yet. 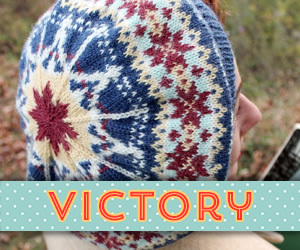 Fast forward to early January this year, when Rochelle personally recommended the pattern to me. That stuck in my mind and when I was trying to come up with a project, I remembered Simplicity 3688 and what she had said. So I owe a huge thanks to Rochelle for putting up with my last-minute emails about fit and sizing, these wouldn’t fit as nicely as they do without her! 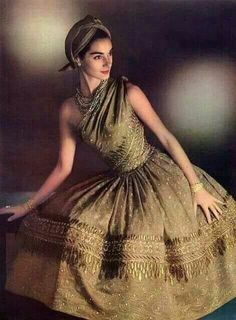 As for the fabric? I bought it during our Chicago blogger meetup last summer, with Liz, Lauren and Meg. That was such a wonderful day and I knew the fabric had to turn into something special. 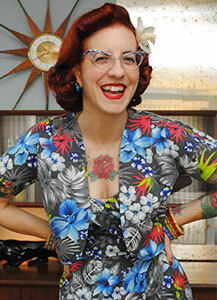 Last but not least, I was inspired by several of the deadlines Debi herself has set for some of her sewing projects. 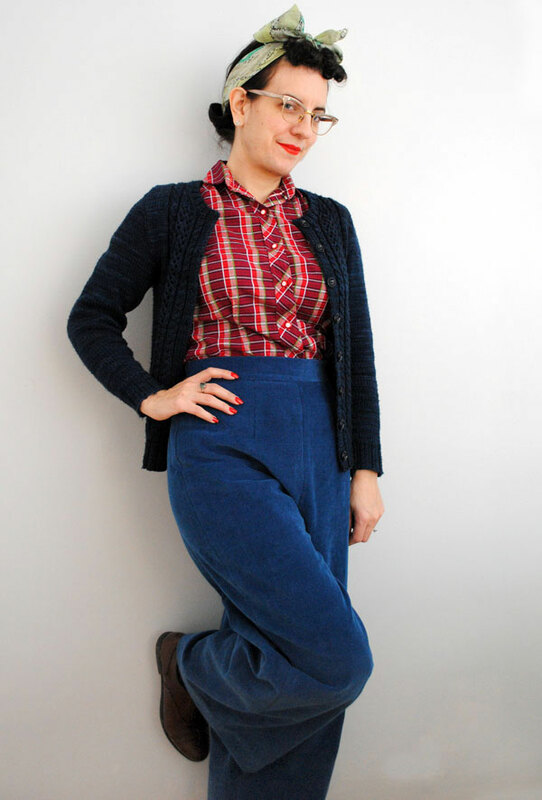 I channeled Debi to get these trousers done and photographed in time! If you haven’t been following her posts this week, you simply must go check them out. 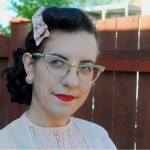 Her Sew Grateful project is stunning! 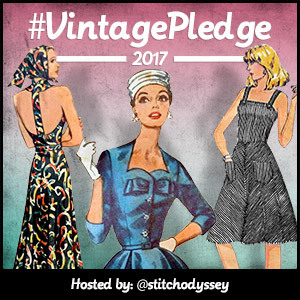 This project also marks a really important milestone for me: I’ve officially sewn more garments in 2013 than I sewed in all of 2012. I know. It’s only February 7th. I think my sewing demons have been left behind for good. And I couldn’t be more grateful for the online sewing community to help make that happen in so many ways. Tutorials, inspiration, friendship and support. Thanks Debi! And we totally will wear them together! p.s. We have our general dates figured out for the trip so I will be emailing you soon!! Also, I need to know if you knit that sweater, and if so, what is the pattern? It is gorgeous! I just recently re-fashioned the sleeve caps (I knit it 2 years ago and never wore it), so I’ll be posting about that soon too! Okay, you’ve inspired me to make a million pairs of these for myself. I love them!! 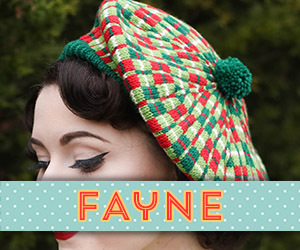 I think I may even have this pattern in my stash? If not, I’m going to pick it up this weekend. Looks fabulous!! 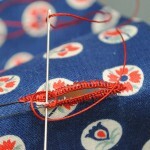 That was the moment I had– “wait, I think I have this pattern” LOL! 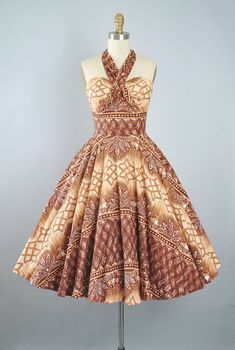 I totally am going to make a wardrobe FULL of these, you definitely need to sew up this pattern too!! Those are adorable! 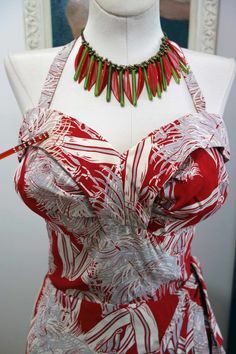 Is this a current Simplicity pattern? These pants are a triumph. Not only do you have a confident sense of your own style, but these reflect your new confidence in sewing too. 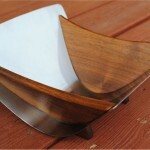 I’m a new follower of your blog, but you’re super inspiring to me. Wooot! 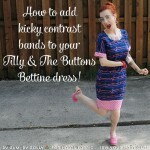 How speedy you’ve become with sewing projects, and they all look so good too!!! These trousers are wonderful and seem like thy would be a great staple in one’s wardrobe. Are you going to make a few more pairs after these? YOU look great and those trousers turned out marvelously. I’ve been wanting to make a pair of these but am afraid they won’t look good on my because I have a bit of a belly. I’m big on wearing pants around the house and these would totally work for me. Love the trousers….and the shoes! Very drool-worthy. Oh yay glad to see these made up and so lovely!! 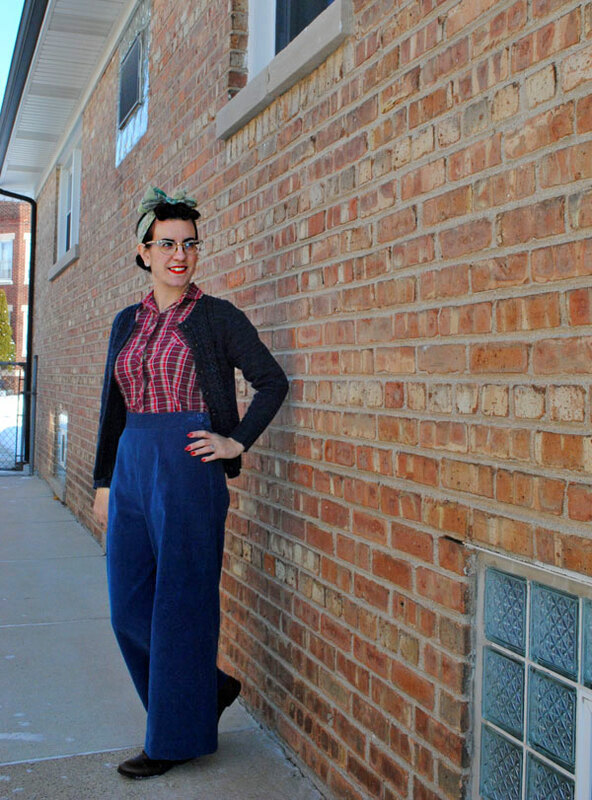 I chose these pants to make for Rochelle’s 1940’s sew along. Glad to know they can easily be made on a tight deadline because I’m quite the procrastinator! Those trousers are lovely! I’m so impressed with how many projects you completed already. It’s good to read your sewing demons are gone now! Such a nice colour! I’m another fan of this pattern, though I’ve only made it up once so far. 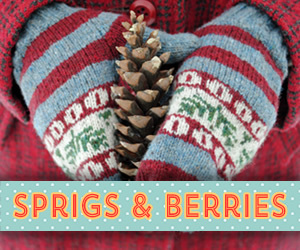 I’m planning on another pair for Rochelle’s sewalong too, in either a black or navy wool. 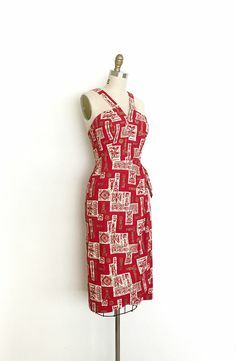 I have plans for a red linen pair for summer too, if we ever get weather warm enough for it this year! I think I’ll drop a size on my next pair as I found they are excessively wide fitting. Quite unexpected as I so often have to add width to accommodate my thighs. It does mean my current pair are super comfy for slouching round the house in mind you, lol. Your trousers turned out lovely! 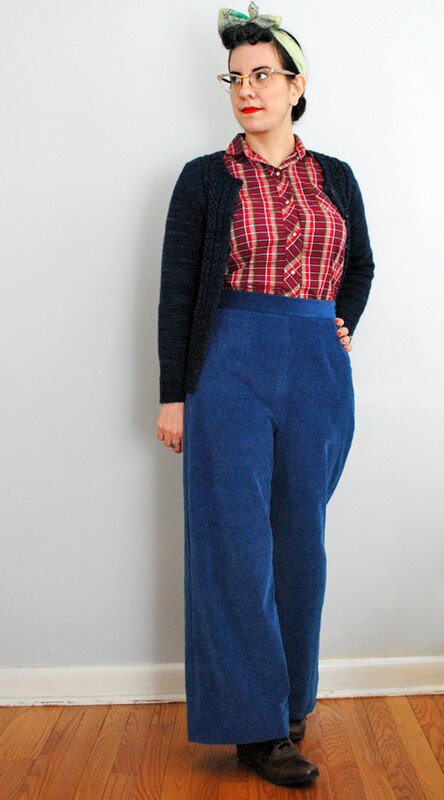 I used that same pattern (with some adjustments) for my own 1940’s dungarees. I love the fact that you made them out of corduroy, especially that lovely blue color! great job and I love that they are cords. They’re thoroughly fantastic! 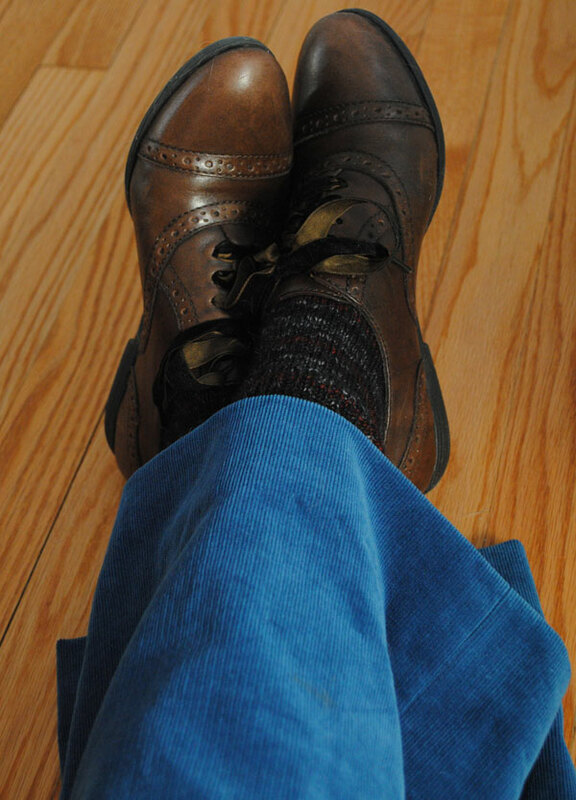 I love that versatile, classic shade of dark blue – and in corduroy (a personal fave) to boot. I think one could get as much wear and use out of a pair of trousers like this as they could from jeans. Awesome job – not only on this project, but on the volume of sewing you’ve already completed in 2013. Way to go, girl!!! Thanks so much Jessica! You know, that was in fact *exactly* what was in my head when I made these, that I wanted a pair that would be as versatile as jeans! These look amazing Tasha, well done! You look absolutely stunning in those!!! The blue cord is fabulous and will definitely keep you cozy in the freezing Chicago weather 🙂 I have this pattern and LOVE it! Love love LOVE! Your hair looks adorable, too! 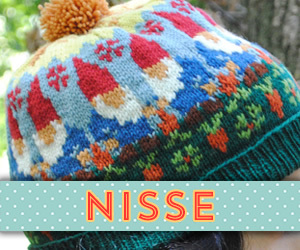 I have this pattern and I definitely need to make a pair for the coming winter. 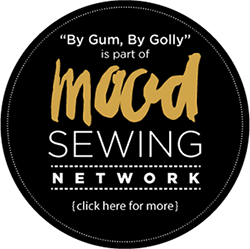 this makes me want to really get serious about my sewing. I’m only a strong beginner, but I love these and the shoes are Fantastic. Wow, they look great? I know you said they were easy to make, but you’re experienced. I’m pretty new to sewing and pants always seem so complicated and difficult – think I would be able to tackle these? Ohmygosh! What awesome possum trousers. They are stunning! The colour looks amazing with your fabulous nails and it suits you beautifully. Your trousers are awesome and I love the colour and your fabric choice. I’ve been wanting to make some trousers and I just bought this pattern last week. Now I can’t wait. Super cute! I love the color you made them in! 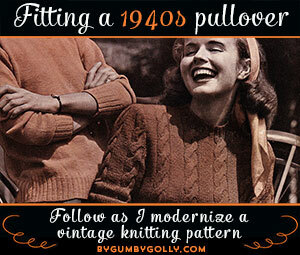 Too funny, just as I read this, I am wearing my own pair made from this pattern. Unlike you, however, I actually had to ADD length 😉 They are great, aren’t they? Great trousers and great outfit/styling as always. I have been checking out this pattern after having seen several versions of the trousers around the interwebs so maybe I should finally bite the bullet and get it. Never really thought about corduroy much but I actually love it. Thank you for being such an inspiration. Can’t wait to see more of your knitting either!!! Oh my goodness, you’re talented! I love these trousers, and your whole look is perfect! Love love love! Hi Tasha. Every decision to make these trousers was the right decision. The period styling is awesome. Love those! I finally sat down and planned out my spring sewing and this pattern is my first place to start. Great to know it’s an easy patter! Way to go! These pants are fantastic!! 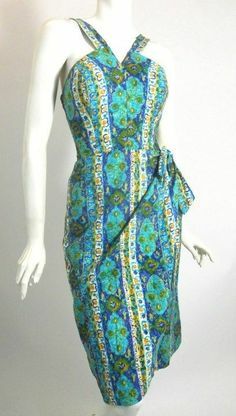 Great color and fabric choice too. I haven’t made the pants from this pattern, but I DID take a stab at the suit this spring, which would have gone well if I could have gotten the lining to hang right and hadn’t bungled the fusible interfacing (hello, puckers…). 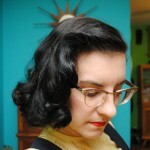 I’m still bummed, because I really want a smart 40s suit, and they cost mondo $$$ on Etsy! Think you’ll try the suit? If you did, it would totally inspire me to have another go!! Great trousers. I love the colour and they style. 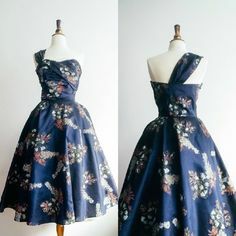 I’ve got this pattern in my stash and haven’t got round to making it up yet, but you’ve just inspired me to move it up the sewing list! 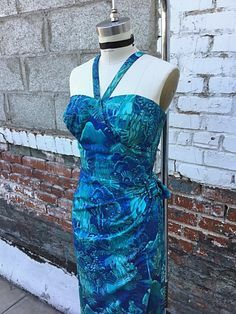 Well, you’ve inspired me to get off my rear and try making this pattern too (I had it in my stash, along with several yards of mystery olive fabric) and you are SO right, it’s pattern perfection! Yours are absolutely delightful, and oh-o-flattering. 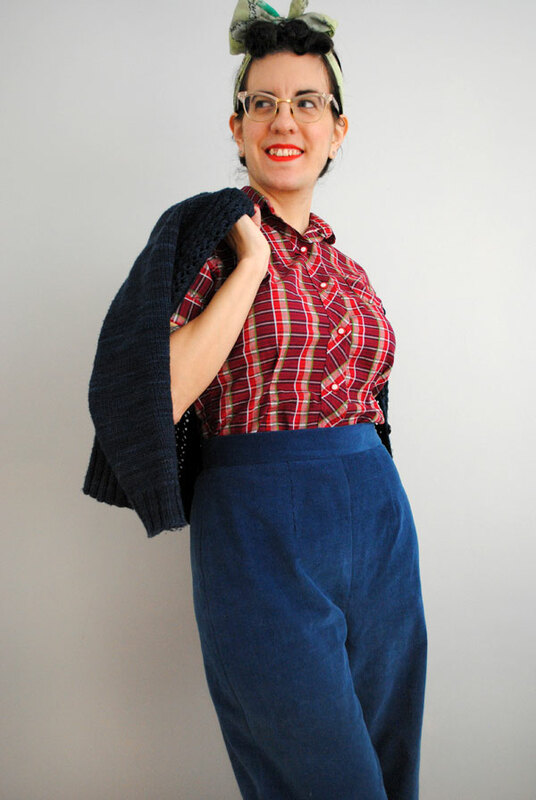 I think a corduroy pair will have to go on my to-sew list next! They’re wonderful! I went straight out for fabric and the pattern and am wearing mine now. It feels so strange to have the waistband on my actual waist…and it feels great! Mustard fine wale corduroy for me; thanks for the inspiration! They look amazing.I have the same pattern but haven’t sewn it yet.Now I need to get busy.love the color of the material.